Anita is waiting for Adam to be released from prison. They met twenty years ago at a New Year’s Eve party in Paris, a city where they both felt out of place—he as a recent arrival from the provinces, and she as an immigrant from the island of Mauritius. They quickly fell in love, married, and moved to a village in southwestern France, to live on the shores of the Atlantic with their little girl, Laura. In order to earn a living, Adam has left behind his love of painting to become an architect, and Anita has turned her desire to write into a job freelancing for a local newspaper. Over time, the monotony of daily life begins to erode the bonds of their marriage. The arrival of Adèle, an undocumented immigrant from Mauritius whom they hire to care for Laura, sparks artistic inspiration for both Adam and Anita, as well as a renewed energy in their relationship. But this harmony proves to be short-lived, brought down by their separate transgressions of Adèle’s privacy and a subsequently tragic turn of events. 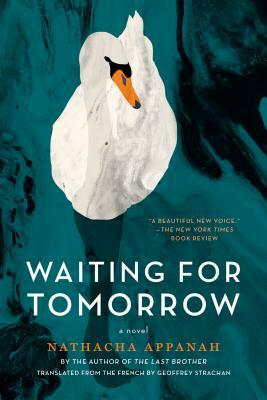 With the careful observation, vivid description, and emotional resonance that are the hallmarks of her previous novel, The Last Brother, in Waiting for Tomorrow Nathacha Appanah investigates the life of the artist, the question of cultural differences within a marriage, and the creation and the destruction of a family. Geoffrey Strachan is an award-winning translator.